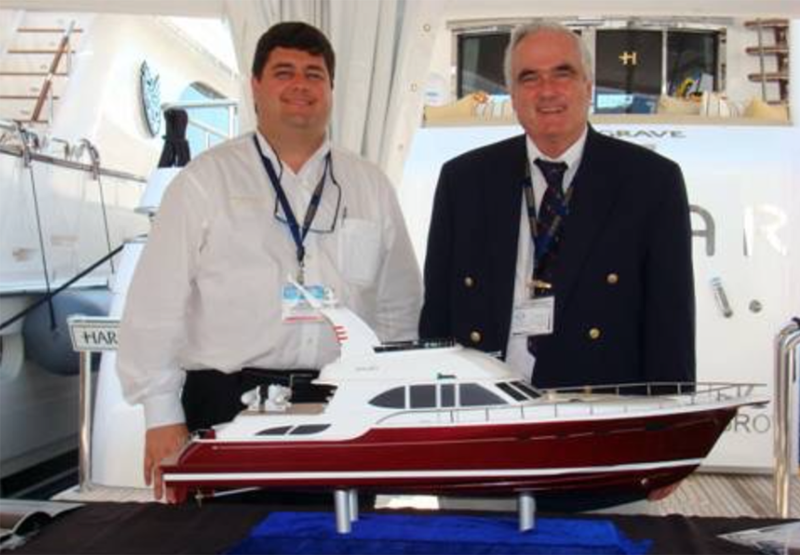 Colonial Yacht Sales President Mike Joyce (right) and Hargrave Custom Yachts President Michael DiCondina (left) have announced plans to sell the Hargrave brand. Colonial Yacht Sales said it plans to sell Hargrave Custom Yachts in the first half of the year. Michael Joyce, owner of Colonial Yachts, said in a statement that he told Hargrave President Michael DiCondina to find the “the right money partner” for the brand. Joyce said he would love to find a billionaire. “The brand deserves to grow and develop and when you see what Hargrave will have on display at the 2019 Fort Lauderdale Boat Show this fall, you&apos;ll know why now is the right time to make that decision,” said Joyce in the statement. Joyce, who turned 75 this year, made his first acquisition in the marine industry 50 years ago when he bought a 100-slip marina in the Thousand Islands on the New York-Canadian Border. He installed a boat sales and service operation. In 1977, he sold the marina operation and moved to Palm Beach to work for Hall of Fame yacht designer Jack Hargrave. He eventually opened Fort Lauderdale-based Colonial Yachts Sales in 1981. Joyce acquired the rights to Hargrave Yachts from Hargrave’s wife, Janet, after the designer passed away. "We literally could launch a new project in hours because of all the design, engineering, and proven test data that we already had in hand,” said Joyce. He formed Hargrave Custom Yachts in 1997 and began building custom motoryachts. Joyce said that Hargrave’s recent order book totaled over 1,000 feet of new yachts under construction, valued in excess of $100 million. “When you look at the brokerage market you can see that Mike DiCondina and his team were selling and delivering new Hargrave yachts throughout the decade-long recession and now he has the company poised to expand into even larger yachts when the next wave of new models begin to appear over the next 18 months,” said Joyce. He said the largest Hargrave will be 184 feet.